‘The time has come to take decisive action,’ said GAA director general Paraic Duffy today. 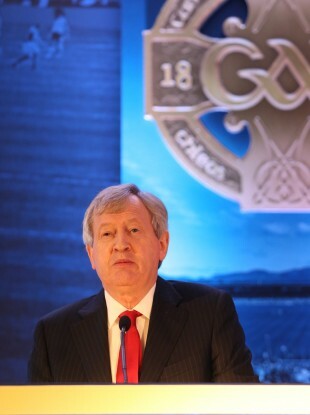 GAA director general Paraic Duffy. THE GAA TODAY released a discussion paper which proposes a number of major changes to the structures of its competitions and fixtures. Aiming to address two main issues — player over-training/burnout and a fair fixtures calendar for club players — the 21-page document explores how improvements can be made by drawing on eight reports published between 2004 and 2015. “Solutions that will address the problems of player over-training and burnout and of fixtures scheduling are available to the Association,” said GAA director general Paraic Duffy at Croke Park today. “That we have failed to make adequate progress in the past is due to a combination of factors, notably a failure to implement decisions taken, reversing decisions already taken, not properly engaging with agreed initiatives, and an unwillingness to change existing competition structures. The ten proposals come under three headings, and among them, it is suggested that the U21 football championship, the National Football League Division One semi-finals and the All-Ireland junior football and intermediate hurling championships all be scrapped. At inter-county level only, the minor (i.e. U18) hurling and football competitions to be re-graded as minor U17 and to be played alongside the senior championships, as is the case with the current minor championships. Increase the number of two-code weekends in the National Leagues (i.e. hurling and football played on the same weekend). Discontinue the National Football League Division One semi-finals. Establish in rule that players who are not in the inter-county match-day panel of twenty-six must be available to their clubs on the weekends of National League and senior inter-county championship games. Bring the All-Ireland senior football and hurling finals forward by playing the All-Ireland Hurling final on the second-last Sunday in August and the All-Ireland football final on the first Sunday in September. Complete the All-Ireland U21 hurling championships before the All-Ireland senior hurling final. Discontinue the All-Ireland junior football and intermediate hurling championships. Introduce a calendar-year fixtures schedule. What do you make of the proposals? Email “Scrapping U21 football championship among new proposals as GAA addresses player burnout”. Feedback on “Scrapping U21 football championship among new proposals as GAA addresses player burnout”.